It has come to the attentions of Rivers Media that Boko Haram terrorist which goes by the name Fulani Herdsmen, well-trained soldiers are ready to strike Obigbo soon. This murderous plot has been ongoing for decade now. Already their evil plot was said to begin operations this March 2018 base on our investigations. On the 5th March 2018, a farmer was allegedly killed by Fulani Herdsmen at Igboeche Obigbo (Igweocha) Rivers State. A farmer went at the night to guide his farm with the wife against crops damages. Immediately the Fulani herdsmen saw the young man. They brought out knife and dagger, butcher this young man to death, while the wife of the farmer saw the husband was down at the mid of the night, she ran for help but in the process, it was late to rescue the husband. The wife of the victim narrated that they went at the midnight to watch over their crops against invaders. Only to see Fulani Herdsmen terrorist were responsible for the damages done on their maize. The husband was hiding to glance through their operations unfortunately he was taken by surprise, when he was stabbed at the back to death. Rivers Media investigated the matter and found out that Fulani terrorist/Herdsmen are not yet satisfied with the killing, they are yet to strike again but it will be bloody. Since the community heard of the bloody threat by Fulani Herdsmen, unnecessary tensions have engulfed in the community. yet nothing is done calm the situations on the ground. But the IG of police has ordered for the disarmament of vigilantes. The IG of Police has directed that civilians, vigilante groups, neighbourhood watch security groups, hunters should surrender their firearms with the licenses in 21 days. This order, relayed by Force PRO Jimoh Moshood, stated that failure to comply would result in raids and clampdowns, following by criminal prosecution for illegal possession of firearms. The order has sent jitters down most Southern Nigerians, who perceive it as a sinister move aimed at disarming them so as to facilitate easy massacre and invasion by Fulanis who have killed no less than 3000 innocent Nigerians since 2015. 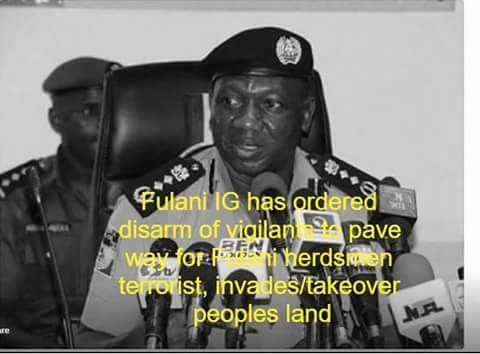 More shocking was the observation that no mention was made of disarming Fulani Herdsmen who are armed with AK 47 assault rifles and sub machine guns, which are illegal firearms. Rather the target of the order is law abiding, legally licensed owners of firearms. This is an urgent wakeup call to the South. This order must be massively resisted from all levels to protect ourselves and families. Since the security machinery of Nigeria is in the hands of the Fulani, we cannot trust them to protect us or respond to distress calls if under attack. Biafrans must wake up and stop the disarmament of her vigilantes by Federal Government. This is another plot to massacre our youths in mass. They haven’t disarmed the Fulani herdsmen terrorist but innocent vigilantes who secure the communities against murderous agents.